This Prospex Street Series model was inspired by the 1975 Seiko divers watch featuring the same classic outer protection but with a more compact structure that’s suited to today’s fast paced urban lifestyle. 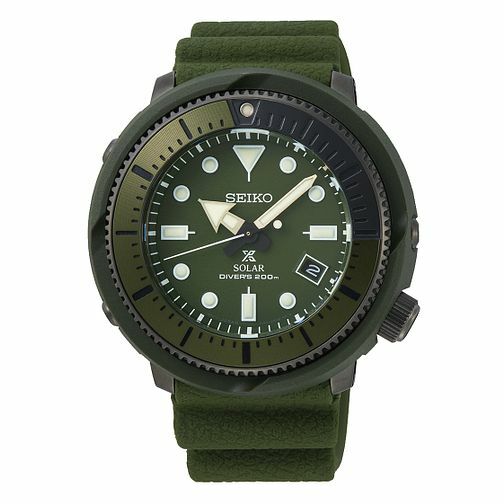 The olive coloured dial and three dimensional leather textured silicone strap reflects a more modern design. This watch is ready for both day and night with a solar powered movement and lumibrite hands and markers so it’s still possible to read in the dark. In addition to featuring a date window and with a water resistance of 200m, this watch prepares you for the everyday demands of modern living.